"New Zealand has been through a tumultuous time and to have something to lift us up is important. Fraser's sculpture emphasises what art can do for us. 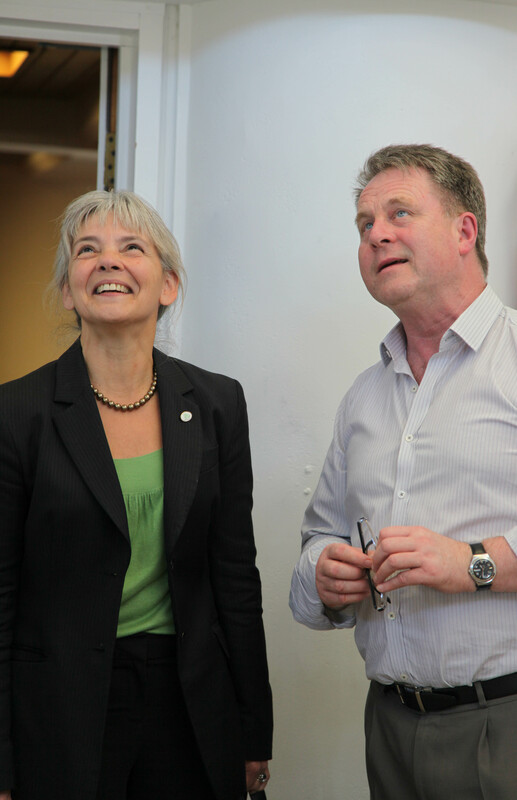 It can take us away from the mundane things in life and up to where we belong," said Suzanne Snivelly, patron of Vincents Art Workshop, at an Arts Access Aotearoa event last night to bless Fraser Hoffe's work in its office. Wellington City Councillor Ray Ahipene-Mercer, who blessed the work, described it as a taonga. In his karakia, he spoke of new pathways, new life and moving forward. 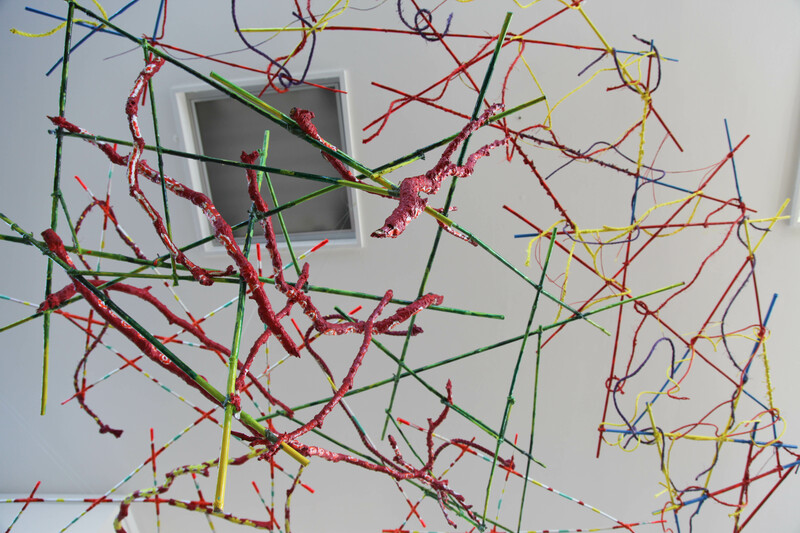 The commissioned installation hangs from the ceiling of the Arts Access Aotearoa office on the third floor of Toi PÅneke. 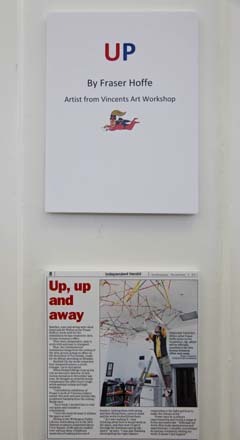 Entitled UP, the work comprises four integrated pieces (a circle, triangle, curve and spiral). Richard Benge, Executive Director of Arts Access Aotearoa, told guests about seeing Fraser’s kite-like sculptures hanging from the ceiling at an exhibition of his work at Vincents Gallery earlier this year. 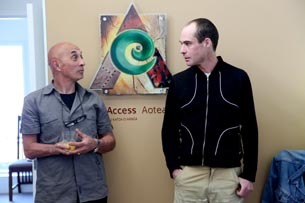 He subsequently invited Fraser to visit Arts Access Aotearoa’s space and consider a commission. In an earlier interview with Arts Access Aotearoa, Fraser talked about “making things” and how as a child, he always knew he was a creative person. It was, he says, his “reassuring voice”. After school, he did leather work and design before becoming a stand-up comic, writing his own material. At the same time, he says he was always “making things” to put on his bedroom wall. “I achieved a lot but I was never totally satisfied,” he says. Then finally, in 2009, he found Vincents Art Workshop and his “reassuring voice” returned. He goes there every week day except Thursdays (a women’s only day at Vincents), when he goes to Pablos Art Studios. “Vincents gave me a place to come to every day and it focussed my energy on being creative and making art,” Fraser says. “I was able to gather together all the things I liked about myself and glue them together. It’s taken a while for the walls around me to come down and my artwork has been an important part of that process. “At Vincents, I found out what I enjoyed doing and set goals for myself. It’s good to be around people you can trust – people who are positive and know about discrimination and low self-esteem. People who have found a place where they can be themselves and let their personality shine. Fraser has had a solo show and participated in group shows at Vincents Gallery and has been in several group shows at ROAR! gallery, which is part of Pablos Art Studios. Original generation time 5.0851 seconds. Cache Loaded in: 0.0004 seconds.